A deserted blog is of no use. When you add impressive content, pictures, and matter to your blog, it deserves a good amount of engagement. Now the question is how to inspire readers to engage with you? Well, this can be done in the form of blog comments, special mentions on other blogs, references on social networks etc. Your blog is almost nothing without the audience. It is the reason your blog exists. Hence, you must understand who your audience is, the kind of support they need, and in what ways your blog can help them. Make sure it is created in a way that your readers would want to visit again and again. Most of the success of a blog depends on user experience. If you wish people to be repeat visitors to your blog give them a wonderful experience. Start with giving a shout out on reasons your blog exists and how people can benefit from it. Remove non-performing ads, badges/widgets and make navigation as easier as possible. All links of lesser importance should be moved to the footer. Check for broken links on a regular basis and fix them as soon as possible. Page load times should be improved. Most WordPress developer and professionals will agree with this. Offering free download against subscribing to your email list will let you send updates on new content to those who may not have subscribed otherwise. This offer may be a template, online ebooks, template, discount code, checklist, etc. The way you pitch other bloggers also matter. Some of the bloggers get a good amount of guest post pitches. Many get deleted instantly due to the quality issue. These are written poorly. Many are simply templates with no traces of personalization. It is important to ensure the pitches stand out via scripting personalized emails. These should sound like real emails. Ask a question will also boost engagement. So try making queries on emails sent to subscribers or at the end of your blog posts. The type of questions and time of posting will depend on your goal. Not leaving comments can be considered rude or unprofessional. A large part of engagement is building ties and networking with other bloggers. Leaving helpful comments on other blogs within your niche will help. Engagement comes easy if you respond to comments is essential. The practice is quite helpful in getting to know your audience or blog readers better. You can build a more meaningful connection with them. You will also get valuable feedback. If you haven’t thought about it seriously, do it now. You need to focus on building a dynamic presence in various communities and forums. Pay attention to areas where your niche audience hangs out. Try out Facebook pages and groups, Sub-Reddits, LinkedIn groups, and Google+ communities. The idea is to maintain focus on developing relationships and helping others than dropping links to content. It creates goodwill within your niche market. It is good to rely on other blogs with a good number of engaged audience. Growing audience is the best answer for increasing engagement. You can do this by contributing to other blogs, especially within your niche. Make sure you focus on those with the engaged audience. Make a quick Google search to get started. You would come across several lists of top blogs in several niches that you may use. A number of social networks and communities are also available that you may use for the same. Although this doesn’t mean your blog will be flooded with traffic, the kind of traffic you attract is targeted. 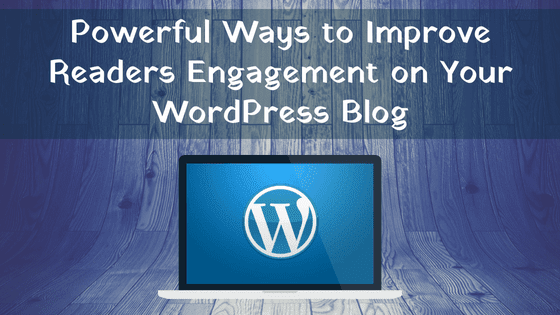 It will also engage with your blog. People visiting the blog may read guest posts prior to making a decision. This increases visibility. One of the concluding things I want to recommend for engagement is adding some sort of content sharing icons for people to click and share the content they prefer. So having things like floating share icons or content sharing plugins can enable users to share your content on Social Media and that’s a perfect way to increase engagement on your blog. Copyright © 2017-2019 Proudzones Blog | All rights reserved.